Father's Day is almost here and that means that it's time for golf courses to start marketing to their loyal following of fathers, mothers, wives, grandparents, and even kids. From gift cards to new golf bags, it can be a little tricky trying to help your customers find the perfect gift for dad. The Father’s Day rush is a great opportunity for your facility: a retail analysis by the National Retail Association shows that sales for Father’s Day have been on the rise in recent years, with the average customer spending $51.60 on gifts. Here are 3 Father's Day marketing tips to help you boost sales and occupancy at your facility. The best way to grab your customers' attention is to send them an email with a quick overview of your promotion for the weekend. In fact, email marketing has one of the highest ROI within our industry, and better yet, it doesn't cost you anything to put a campaign together. A great promotional campaign starts with a targeted audience strategy. Father’s Day email marketing is not only about targeting fathers; parents, siblings, wives, and junior players are also prime candidates for specials. You can segment your customer database to find couples who play together, both members and green fee players, and market your gift certificates to their significant other. For members, given that most soft goods are already paid for, you should promote gift certificates for hard goods at the pro shop or a 2-for-1 meal at the restaurant. As for green fee customers, promote gift certificates for soft goods like green fees, carts, the driving range or even lessons. The main takeaway here is to target multiple audiences at your facility, and to not solely rely on targeting fathers directly. Fathers are notoriously hard to shop for. Make it easy for your customers by creating an online gift guide on your home page. If you don't have an online store, you can still display a gift guide on your website, but the call-to-action would be to call the pro shop for more information. This is another easy way of getting your message in front of your customers - especially those that use your website to book online. In our experience, packages, ticket books and punch cards for pre-paid rounds of golf are best-sellers. You can get creative with how you group complementary items together and save your customers time by offering them a more attractive gift. 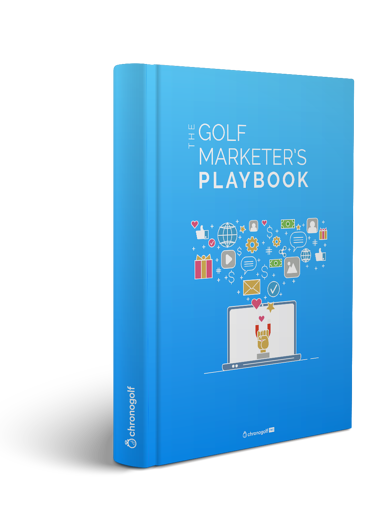 Get the Golf Marketer's Playbook for free! Golf is an inherently a great gift idea for Fathers who are difficult to buy for. Thankfully you can make it easy for your customers to buy for dad. Curating a gift guide, using email marketing and your website to promote it not only helps your busy customers find great gifts without having to hunt for them, but it also gives you a great opportunity to differentiate and stand out amongst neighbouring courses.